As we head into even more conflict this week, it’s a good time to discuss the general idea of conflict. Simply put, we need conflict. Rather than trying to make it go away, we might do better to understand its role in our growth and evolution. We need to learn to make peace with conflict, as it were. How many people think conflict is bad by definition and to be avoided? In fact, there is no avoiding conflict. We don’t all want the same things, and that, in a nutshell, is the source of conflict. There seems to be a movement these days toward trying to get everyone to want and need the same thing. We’re all supposed to hold hands, sing Kumbaya, acknowledge that we’re all part of the human family, etcetera ad nauseam. The first tactic is to try to persuade everyone to agree on what’s desirable. When that doesn’t happen (and it never will), group leaders resort to underhanded, manipulative tactics to try to coerce others to accept their worldview – the whole point being to avoid conflict. It’s comical, when you think about it. The result, however, is no laughing matter. One of the most insidious manipulation techniques I’ve had to grapple with over the past couple of weeks is the use of pop psychology terms applied backwards. I’m reminded of a situation I encountered as a teenager babysitting two small children for the couple next door. Jody, 5, had discovered an ingenious means of getting what she wanted. She’d walk up to her 3-year-old brother, Danny, and grab his toy, often by force. When he put up the predictable protest (which typically involved hitting and pushing), she’d go to her mother and complain in her best victim voice, “Danny won’t share” or “Danny hit me.” I witnessed poor Danny getting spanked more than once. Finally, I said something to their mother, who immediately called Jody into the room and asked whether it was true that she took Danny’s toys. Of course, Jody lied, and her mother accepted her word over mine. I tried to help Danny by giving him extra special attention and care. But then Jody started making a fuss whenever I babysat. I don’t need to tell you how that turned out. I’ll let you draw your own conclusions about how this story applies to many relationships today, be they political, social, personal, or romantic. For my part, I’ve had intimate contact with the aggressive side of Mars over the past few weeks, and I’ve finally realized with crystal clarity that it serves a productive purpose – even as it destroys. The old and unworkable needs to be eliminated in order to clear the way for the new and sustainable. The destroyer is serving a high and noble cause, but invariably, he is labeled “bad” and “negative.” It does tend to make him a bit feisty and irritable. Hopefully, under Mercury and Mars retrograde, some light will be shed on how situations and relationships devolved into irreconcilable conflict and how we can move past these obstacles to reach our goals. Saturn retrograde in Libra with Mars retrograde is helping us to understand the role of conflict in finding balance. Balance doesn’t happen by forcing everyone into agreement – if that were even possible. We need multiple points of view. Without them, what we have is the tyranny of the majority our forefathers warned against. Have you ever noticed that when disagreements arise, people tend to try to convince others of their position and then form a group of people who think the same way? Truth isn’t determined by numbers. As of last Friday, Mercury is in Aries, so now he and Mars are in mutual reception. As I predicted, the noise level went up immediately, and it will go up another several decibels when Mercury turns retrograde on March 12. In addition, computer problems are escalating from the merely frustrating to the absolutely ridiculous. I’ve been editing a spot for the film and video program that should have taken a week. Due to computer breakdowns, I’m now in my fourth week and counting. If any of you tried to access RealAstrolgers yesterday, you may have noticed a page of error messages. The fix took more than three hours, although I can’t fault my web host, InMotion Hosting. They were extra busy yesterday – big surprise there – and did the job as fast as they could. And they were so darn polite – a real feat, given the astrological climate. On Thursday, I received an e-mail from a client about a computer nightmare at her workplace that could turn into total chaos when her company switches over to a new system on March 12. Monday’s conjunction of Mercury and Uranus is the spark that ignites the electrical fire – literally and figuratively. I can’t say it enough: back up your computer data! 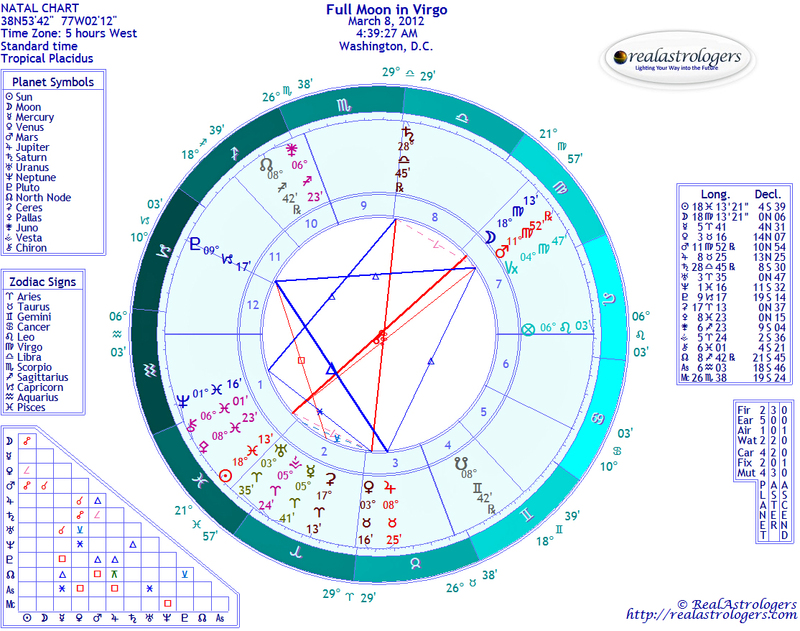 Thursday’s Full Moon in Virgo likely will bring a lot of conflict to a head, so be prepared. As the volume increases, seek to maintain your integrity and responsibility – two key ideas for Saturn in Libra. Know what you want, why you want it, and what you have to do to get it. Know the difference between selfishness and enlightened self-interest. This distinction will become increasingly important as Uranus approaches an exact square with Pluto. Conflicts that emerge now actually can help you clarify your goals and purpose. On the positive side – and there is one, thank goddess – Venus enters Taurus on Monday. Jupiter also is in Taurus, and these two are quite a lucky pair. They’ll form an exact conjunction next week, but they’re close enough at the Full Moon to create a positive vibe for manifesting real, concrete results, despite the tension and conflict – or perhaps because of it. Venus and Jupiter will form one leg of an earth trine with Pluto in Capricorn and Mars in Virgo. This creative configuration reinforces the notion that the destructive force of Mars is breaking down structures that are no longer serving us, clearing space for a fresh start. We’ve been traveling that road since summer of 2010 (some of us earlier), and this is a major milestone. Again, it’s helpful to keep our sights on our long-term goals and our life’s purpose as we navigate through the rough seas of the next few weeks. Look for new developments that will blossom with the spring flowers, after Mercury and Mars return direct in the first half of April. Speaking of spring flowers, Venus sextiles Neptune on Tuesday, giving us an opportunity to appreciate the beauty of nature as an antidote to all the BS. This entry was posted in Forecasts and tagged full moon in virgo, Mars retrograde, Mercury retrograde, Saturn retrograde in Libra, Venus in Taurus, Venus-Jupiter conjunction on March 4, 2012 by Pat. “Truth isn’t determined by numbers.” Can I quote you on that? My sister & I had a debate this past week about the nature of truth – she being a born-again Christian & me being a Pagan Spiritualist. Pagans are the Dannys of this world & Christians are the Jodys. People take the word of the Christians because they are more numerous (or at least it appears that way because they don’t hide because they have never been persecuted). Like many who share my beliefs, I struggle to know where to start explaining them to my family. Knowing how everyone reacted to my sister’s religious conversion, I anticipate a never-ending & futile dispute. I agree that conflict is an unavoidable part of life, but sometimes it is just corrosive & never seems to get to the destroy & rebuild stage. It’s not only world leaders who are hell-bent on “trying to get everyone to want and need the same thing”. Families are just as bad, parents trying to clone their own mindset within their offspring, and people taking sides to enforce their values upon others. I don’t want to waste my time & energy on a pointless battle. Nor do I want to maintain a hypocritical silence. I know that my truth is valid, no matter how many people try to tell me it’s wrong. And by the nature of my beliefs, I’m not about to force them on anyone else. What prevents others acknowledging & respecting different points of view? In the natural world, conflict is a matter of survival – competition for resources. In the modern human world it is more often a matter of ego & completely unnecessary. Egos can’t bear to be challenged. Empires, churches & family hierarchies are built on egos & are always looking for a Danny scapegoat. If the Dannys won’t be given a fair hearing they will eventually have to fight to be heard. This means I had better speak up about my own truth & let the conflict go on. I sincerely hope you are right, Pat, about Saturn & Mars leading to balance in this scenario. I hope those who oppose me will be forced to question their defensive reactions, the robustness of their own beliefs & the reasons why they fear mine. They don’t have to like what I think, or even understand it, but just get their egos in check & show respect. I’ve been meaning to tell you about the vivid dreams I’ve had after you had invited your readers to do so, but it’s been so hectic in my work and personal life that I’ve had to postpone. All of these dreams seemed to be telling me something for sure and I have been writing them down and look up the details on the dreammoods website (www.dreammoods.com). And this has been useful to help decipher the meanings and messages. WOW! Thanks, Pip and Kinja for the great comments. They are posts in themselves. I hope others also find your remarks inspiring, thought-provoking, entertaining, or otherwise can identify with your experiences. Great dreams, Kinja. I’ve had a few of my own, at least one of which “came true” in a big way. Hang in there, everyone! This storm really will blow over eventually.